I'm trying very hard to get back into sewing. I'm happy to say that my quilty obsessing has come back and I am back to the usual constant daydreams and quilt plans and virtual shopping and pretend bundle making and all that. Its only the actual sitting at the machine I've been stuck on! My beanybump might not actually be all that big, but anyone would think I'm 39+ weeks I seem to be so useless at sitting upright or bending over. Seriously, some days I cant put my bloody socks on! Anyway... I've been easing myself into sewing doing small bits at a time, and I have a couple of finishes to show for it now. First up we have the California Dreamin' quilt. Mum pieced this in an afternoon (when I was poorly and napping) from a fabulous pattern in the Fat Quarterly Shape Workout book. I got my lovely mate Emily to do some meticulously spaced straight line quilting on it, and I did some "organic" hand quilting in the solids. The second one,( pictured on its side cos I didnt want to get the bottom wet!!!) is my first and probably last entirely Half Square Triangles quilt. Wow, this was soooooo tedious to make. Dont get me wrong, I really like it, and I'm happy with the block I chose, the solid I went for etc. But eugh. So many hsts! Not exactly enjoyable to piece. In fact, it wouldn't have been made at all if I hadnt had mum on trimming duty! I do like the finished quilt though. This was basted by Emily too, and I managed to quilt this one myself with a nice simple grid layout. Those are both lovely and I am glad you are getting a chance to do some sewing. I know exactly what you mean about HSTs - they are a total pain in the arse, but worth it in the end! two lovely quilts, well done even starting the HSTs! !! the quilts are so lovely. Can I borrow your mum? Just for one little tiny quilt? Take care! Yeah for mojo and mum and Emily! They are both gorgeous! Two brilliant finishes. Good on you! Two most excellent finishes. And yay you with all that hst-ing! Love the finishes, I would never in a million years have done all those HSTs, well done! Very glad to hear about the mojo comeback. I love the HST quilt soooo much. It's sublime. They are both fantastic finishes....and I bet it feels great to have them completed. Looks like you have assembled the ultimate quilty A Team! What lovely quilts. California Dreaming was the first fabric collection I ever bought (still uncut - haven't quite got my mojo back!). Love the HST quilt too. Great, as usual! I particularly like how the longer you look at the hst quilt the more patterns you see. I'm so out of the loop with my blogroll, but I just wanted to say a massive CONGRATULATIONS on the baby news! How exciting for you!!! As always, I marvel at how beautiful your quilting is! 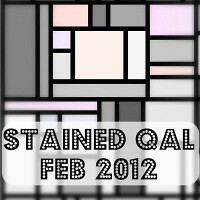 Had to click on your blog (via Lily's Quilts) because the name was so intriguing! Love the quilts, especially the first–such a great use of colour.